A remarkable vision convinces Klik that helping Sun find her tribe is the right thing to do. The rest of Klik’s tribe reluctantly accompanies their leader on this quest, which at first looks to consist entirely of battles with octopuses and half-destroyed dinosaurs. However, the octopus turns out to be the guardian of an unusual island… an island containing a doorway to a new, amazing adventure. 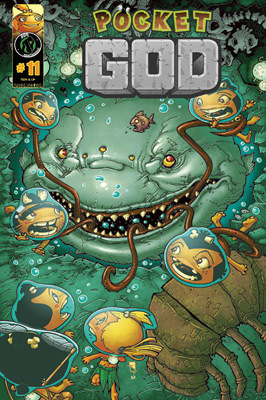 The Pygmies head underwater to find, as Dooby puts it, a “righteous-looking temple.” In their attempts to approach the temple, they find another member of Sun’s tribe, who has been trapped by a real nightmare of a sea creature, the blob fish! Should our heroes escape this menace, a strange underwater race of bubble-breathers may be able to help them… but they’ll have to want to help themselves first! Nooby, confined in the stomach of a blob fish, meets two unlikely allies, one of which is Moon, Sun’s grimmer counterpart in the female tribe! 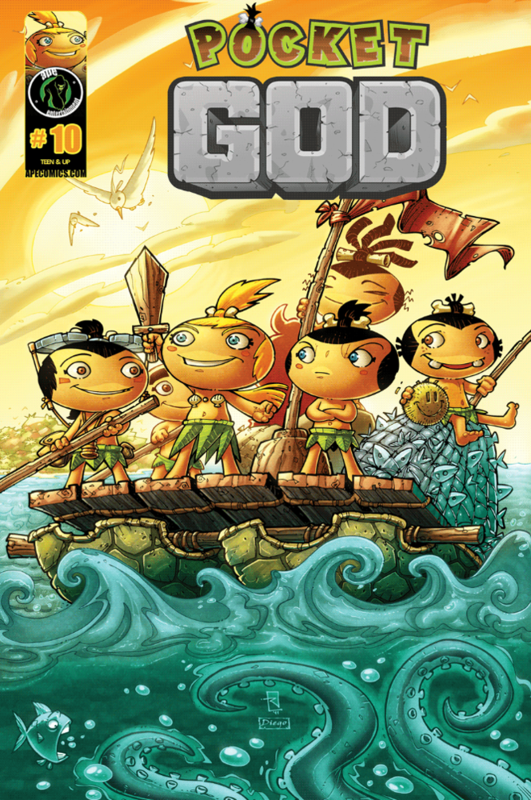 Meanwhile, with the assistance of the bubble-breathers, the remaining tribe members conduct an electrified journey to the temple, where they discover more members of Sun’s tribe… along with their old foe, Newbie! 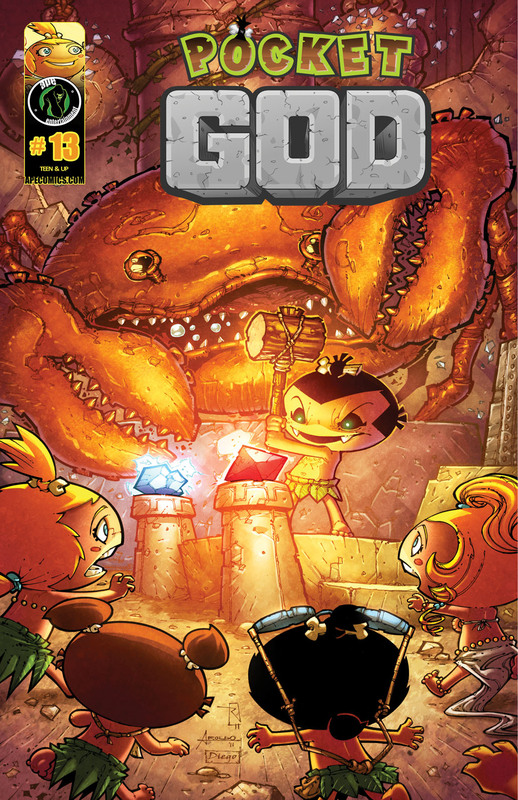 Newbie, with the help of a crustacean bodyguard, traps our heros and heroines and reveals his plan to live forever, by transferring the power of the female tribe’s jewel into a gem of his own! Will help arrive in the form of Nooby, Moon and their bubble-breather ally? 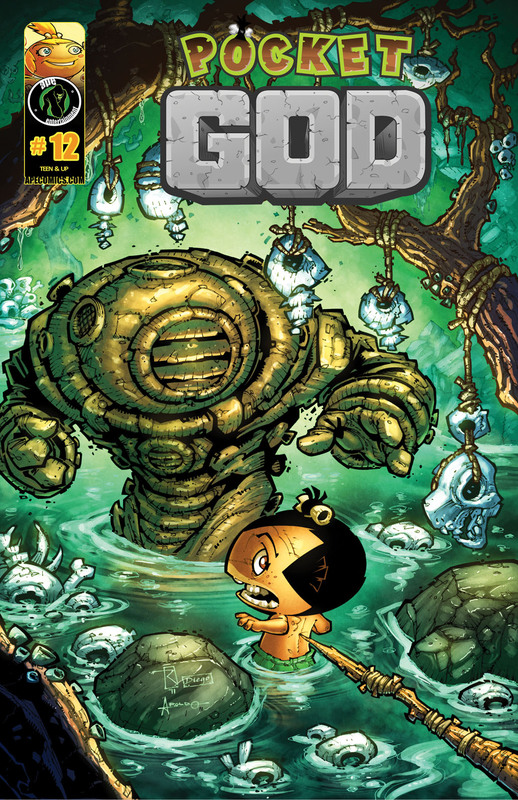 Will Klik end up questioning the nature of the gods? Will the gem’s power be extinguished… forever?